Job interviews can be both exciting and stressful at the same time. You’re excited about the possibility of a new opportunity or maybe you just landed an interview with a company you’ve dreamed of working at. Then the stress sets in. After you’ve called your friends and family to share the news, you think about what’s to come. The questions, the waiting and most importantly… what are you going to wear? A suit should be your go-to interview outfit, no questions asked. Make sure the suit fits well and if it doesn’t, make sure to get it altered. Putting on a suit will not only increase your confidence, but it will show your interviewer that you’re serious about getting the job. Don’t distract your interviewer from your wonderful responses. The blue eye shadow you have? Or the highlighter yellow nail polish? Yeah, don’t even think about it. It may look cute when you go out with friends, but it has no place in an interview. Keep your look simple so that the interviewer can focus on YOU and hear what YOU have to say. This isn’t a black tie event but you should look your business best. Get a haircut, make sure you iron your clothes and remember, you’re never fully dressed without a smile! 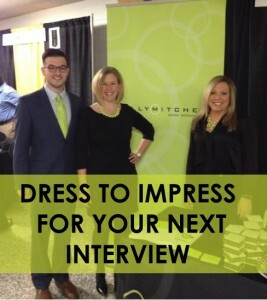 Need interview wardrobe inspiration? Look at our Pinterest page! Perfect Your Pitch – Interviewing Tips to Land the Job You Want!